Citizen reporting is critical to national control efforts of this non-native species. 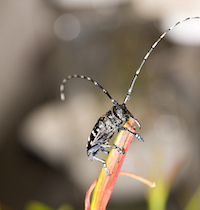 If you see an Asian longhorned beetle please report it immediately to USDA APHIS. 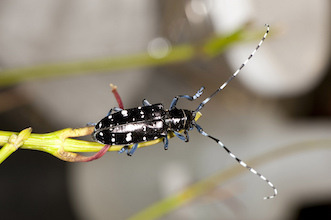 As a generalist pest, Asian longhorned beetle poses a great potential threat to eastern forests. It is currently contained in four small quarantined areas (a fifth was recently eradicated). Burning firewood where you buy it is critical to stopping the spread of this pest. Asian Longhorned Beetle Current Day Forecast. Asian Longhorned Beetle 6-Day Forecast. Non-native Asian longhorned beetles (Anoplophora glabripennis) overwinter as both eggs and pupae. Adults emerge from pupae in the summer, and are typically active until October. Females lay eggs in the bark of trees and larva later emerge from the tree leaving perfectly round exit holes. We forecast adult emergence based on growing degree days. If you observe an adult Asian longhorned beetle, report it online immediately to USDA APHIS (or call 1-866-702-9938). 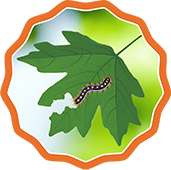 Treatment of infested trees should always be done by professionals in conjunction with state and national pest management experts. Additional resources are available through USDA APHIS, Ohio, New York and Massachusetts Extension.